The Snowy Owl spends the winter months inhabiting the marshes, fields and prairies of Canada, including Southern Ontario, however, they return to the Arctic to breed each spring. This is one of the heaviest Owls found in North America, as females can weigh up to 5 lbs and males up to 3 lbs. These owls often have a wingspan measuring over 4 ft, and stand at 22" to 27" tall. 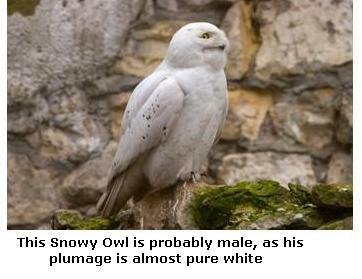 Males are often pure white, although females tend to be slightly darker than the males and their plumage may be white barred with brown and in the picture above, you can see a typical male Snowy. There is a layer of down on the bird which is covered with thick feathers, which insulates the whole body - even the powerful feet and legs are feathered so that only the curved strong claws are visible! 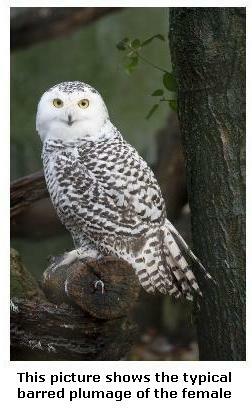 The Snowy Owl lacks the feathery tufts which characterize many species of Owls, and only has slight evidence of them. The beak is black and is perfectly designed to capture and eat the small mammals which are this birds main food - each bird consumes around 8 - 10 small rodents daily! They typically hunt from high points such as utility poles or tall trees where they can observe potential prey as they scan the area watching for mice and lemmings - they even keep a wary eye for other owls which they will chase away from their territory. Although quiet while hunting, these Owls are known to scream and hiss at intruders who are coming into their territory, and have been observed diving at humans who approach their nests. These birds, unlike other owls, are not exclusively nocturnal, and also hunt during the day - perhaps this could be an adaptation because of the long hours of daylight during the Arctic summer? These birds do not breed in Southern Ontario, as they return to their northern breeding grounds in Spring, where they nest on the high tundra, using any tall points of land for their nests. We hope you enjoy this short video, courtesy of YouTube and National Geographic. Have you had a Snowy Owl encounter you'd like to tell us about? If you've had a Snowy Owl sighting in Southern Ontario, we'd love to hear from you ... send us your pictures too! Travelling highway 32 near Mitchell’s Bay, Ontario. Videoed Friday April 14 2017, around 3 pm at Lake Muskoka, Ontario. If you enjoy this website, please consider making a donation to help us continue with this site!